This trendy vegetable shot to fame in a cheesy sauce , but now its in the headlines for a different reason ….. 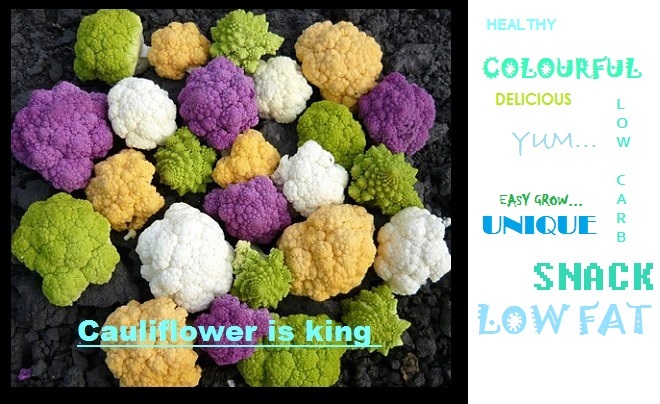 In an age where obesity is a growing world wide epidemic with over 1.3 Billion people overweight , this brazen brassica has turned the tables once again and made us rethink the age old uses of cauliflower . This amazing vegetable not only comes in a variety of colours (purple , orange ,white , and green) but it is an amazing carbohydrate substitute ! low fat ,low carb , high fibre , vitamin C ….. the list is endless its no wonder the potato is going out of fashion . This little low carb snowball could be the answer to many people wanting to change a dress size or two , from cauliflower pizza bases, baked cauliflower pops and cauliflower mash this little beaut is fast becoming the new’potato’ , I hardly think it will every surpass the need for french fries but it might just kick the obesity epidemic in the gut and start pushing mankind towards a healthier, tastier way of living . Don’t get me wrong , I love my deep fat fried ,sugar coated , twice dunked ,sprinkle topped anything , but there needs to be a line . so for those of you who think take out Friday is the easiest answer , maybe try something different … your heart will praise you and your waist will thank you . boil the cauliflower for 5 min , drain well in a tea towel and squish all the liquid out and place in a processor , you should have something that resembles crumbs , add to a counter top (make a well) or a mixing bowl , add your cream cheese and egg and flavourings and mix well . section into portions (balls) and on a piece of wax paper push down into a circle to shape your crust .bake for about 30-35 min until golden while they are cooking get your toppings and sauce ready . saute the above , add some salt and pepper , some oregano and a pinch of sugar . place this mix in the blender and mix on high for 5 min ( yes it must be hot ) take off and reduce further for a richer smoother sauce . if you like your sauce chunky reduce for 5 min on a medium heat . Time to assemble the beast !!! I love the delightful combination of cranberry and orange , it is so refreshing and homey and good enough to serve at the mad hatter’s tea Party . I find it brings a different element to the usual tea time treats of cream doughnuts and scones , which you could also spruce up with a few dried cranberry’s and freshly grated orange zest it is that versatile as a flavour combination . line a loaf /muffin tin with butter and flour or muffin cups if you are planning to entertain . Bake muffins in oven 180 °C , on middle shelf , for 25-30 min until a knife comes out clean , if you bake it in a loaf tin it takes approximately an hour . 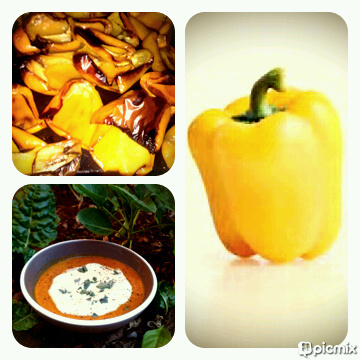 ♥ To SPICE it up add some ground cardamon or grated nutmeg to really give that something extra . This is a great summer and Autumn tea time treat , and easy enough to get the kids involved in beginners baking . A friend of mine cultivates cherry tomatoes and yellow peppers , it was end of her season and she gave me a few to take home . A few being 60 kg’s !!! Say what!?!? Everyone loves roasted red pepper soup but yellow pepper? never heard of it , so I accepted the challenge of making this mountain of peppers into something . LIGHTBULB!!! MOMENT – make a soup or sauce , they freeze well and can be a base for many things such as a pasta sauce , base of another soup , all sorts . remove the core from the pepper and cut into 5 cm chunks , throw in a roasting pan with some olive oil salt and pepper , and place in an oven at 220 degree’s Celsius . In a heavy based pot , add 20 ml olive oil , slice onions , garlic and chilies roughly and brown for 10 minutes add the thyme (without stalk) , sage (freshly chopped), cayenne and nutmeg , allow the spices to infuse . Buy now the peppers should be brown and sweet , add them to the pot and stir . Add stock to cover the peppers , and allow to simmer for 5 min . You can always make this with red peppers as well as a mix of pepper and tomatoes – be creative in the kitchen and play around let your gut tell you what smells.tastes and feels right . South Africa make some amazing complex wines down in the Cape regions , one of my favorites is Pinotage . It is a uniquely South African grape varietal , this unique creation was first made grafting Pinot Noir and Cinsaut grapes by Prof Perold – to today’s legends crafting and creating the latest Pinotage or Pinotage blend. This wine goes lovely with rich spicy dishes , Cape Malay curries are always a winner , Pinotage has chocolaty undertones this works beautifully with dark chocolate sauces or desserts . I use this basic recipe and instead of orange i add (750 ml of wine) , 8 cardamon pods , 2 star anise , one medium cinnamon stick , and about a quarter cup of honey (for a deeper flavour use molasses ) – these are the best of friends with a deep red wine . Once the pears are poached i usually reduce this mixture (strain out the spices) for about 30 min on a medium heat or until it is a sticky sweet sauce that you could drizzle over a side of chocolate mouse and your poached pear . People also think that poached pears can only be eaten with a creme anglais or sauce , not the case , slice it up and lay in a tart shell and cover with a chocolate frangipane mixture – HEAVEN IN A TART SHELL!!! so take those traditional favorites and think outside the box , you wont regret it . there is no short supply of taste testers in my house , where food is made they shall follow .